The Arctic is almost all an ocean including just the northern parts of Canada, Alaska, Russia, Scandinavia, and Greenland. It can be defined in a couple of ways. One way is to use the area inside the Arctic Circle. The Arctic Circle is a line of latitude at 66 degrees 27 minutes north, about 1,630 miles south of the North Pole. This is where the sun stays above the horizon at least one whole day each year (never setting). The farther north you go the longer the sun stays above the horizon in the summer. This is the area of the 'midnight sun.' Another way to define the Arctic is to use the area inside a line drawn around the arctic inside of which there are no trees. This is called the 'tree line.' An additional way is to define the Arctic is where the 50 degree summer isotherm is located. This is the line above which it is always colder than 50 degrees F.
The Arctic was named by the ancient Greeks after a constellation they called Arktos, which is now called Ursa Major, or the Great Bear. 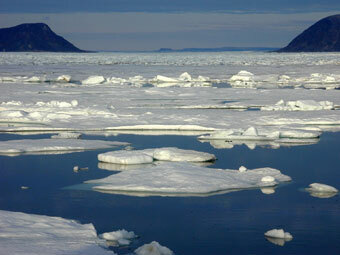 The Arctic Ocean is the smallest of all the oceans and is covered with ice most of the year. It connects with the Pacific Ocean at the Bering Strait and with the Atlantic Ocean on either side of Greenland. The Arctic provides the shortest route between North America and Europe by air. Commercial airlines fly this route daily. Although it is the shortest route (by a straight line -or- as they say 'as the crow flies), travel by boat or overland is nearly impossible because of the ice. 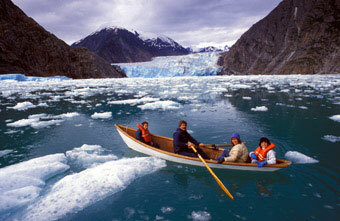 It remains the domain of the airlines to have the largest number of people who traverse the Arctic. And, those of us in the airplanes are just passing through. 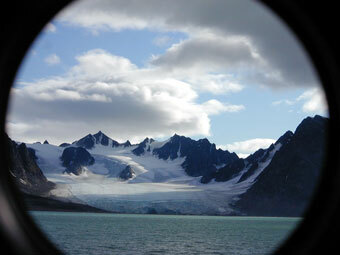 The depth of the Arctic Ocean averages 4,362 feet. 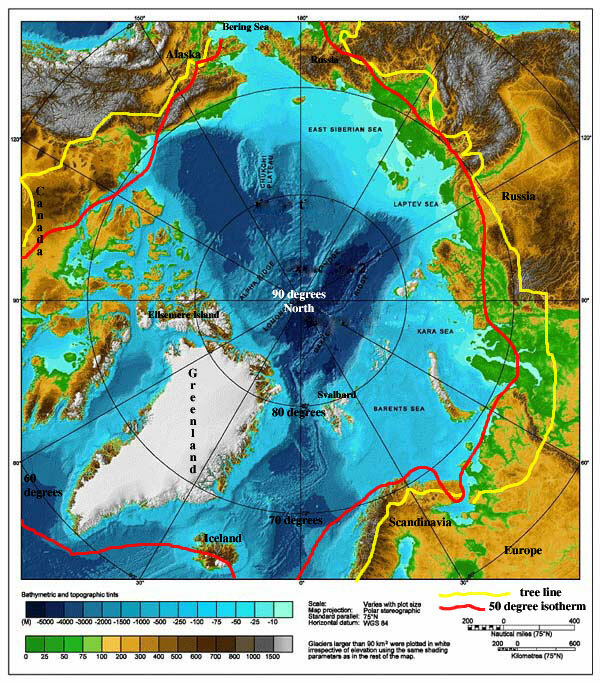 The deepest area is just north of Svalbard at about 17,880 feet. 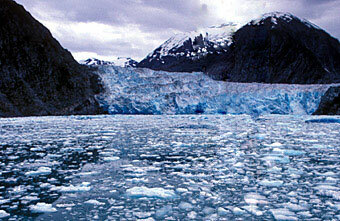 The water in the Arctic Ocean ranges from a plus 2 degrees to a minus 2 degrees Centigrade (close to freezing). As the seawater drops below a minus 2 degrees C it freezes into sea ice. 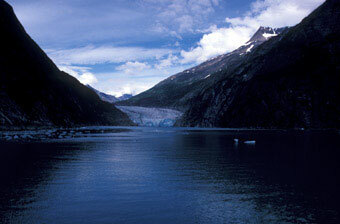 Glaciers are the primary source of icebergs. The 'rivers of ice' slowly flow downhill to the ocean and break off (calve) as they encounter the ocean water. 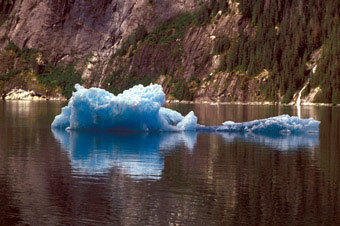 Icebergs are frozen fresh water and come from glaciers on the land. Most of the big icebergs in the Arctic Ocean come from Ellesmere Island and may even be called 'ice islands.' They often last several years and are used by scientists to set up long-term weather monitoring stations where equipment is left for a year or more. 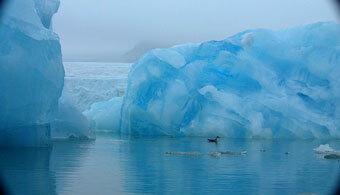 Once the icebergs hit the warmer water of the North Atlantic they usually melt rather quickly. 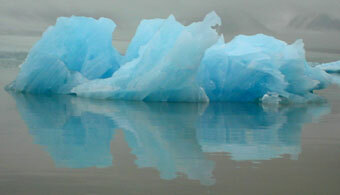 The North Atlantic has many of these melting icebergs that may become a hazard to navigation. There is a North Atlantic Ice Patrol, maintained by many countries who use the North Atlantic for shipping, that maintains constant surveillance in this area. The disaster of the Titanic was a sad lesson showing the need for this type of information. 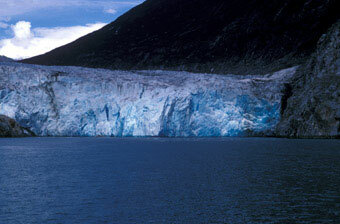 Few icebergs ever reach the North Pacific because of the Bering Strait and the Aleutian Islands. 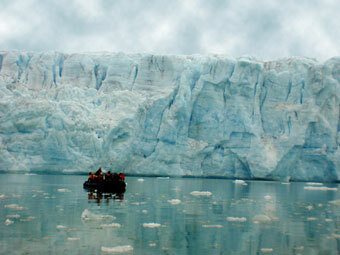 Most of the icebergs in this area run aground and melt in place. There is no Ice Patrol in the North Pacific (like there is in the North Atlantic) even though there is a lot of boat traffic. Precipitation averages only ten inches a year in the Arctic. This is just like a desert. Most of this precipitation is in the summer, is frozen and rarely melts (similar to Antarctica). The seasons are extreme in the Arctic. During summer there is constant daylight for a couple of months near the North Pole. This allows for a large bloom of any plant material because of the constant daylight allowing for 24 hours of photosynthesis. In the ocean this results in a tremendous plant plankton bloom followed by a tremendous animal plankton bloom (of the animals that eat the plant plankton). Most of these herbivorous animal plankters are types of krill (similar to those in the Antarctic but a different species) and other small crustaceans. Plankton blooms provide a great base of the food chain. The plankton is food for small fish and the small fish are food for larger fish and seals. Various whales visit the Arctic Ocean, in summer, to take advantage of this productivity. Baleen whales (like gray whales and humpback whales) may travel thousands of miles to feed on the abundant plankton. Toothed whales (like killer whales) also travel to the Arctic to feed on the abundant fish and seal populations. Most of these whales leave in the winter when the productivity crashes and there are several months of total darkness. The first human travelers to the Arctic were probably the Greeks in the late 300s B.C. The Greek named Pytheas reported that a 'frozen ocean lay six days north of the British Isles.' After this the Vikings were probably the next major explorers in the 800s A.D. A hunt for a passage between Europe and North America began in the 1500s and lasted through the 1800s with numerous explorers and theories about what was actually at the North Pole. Controversy still surrounds the first explorers to reach the North Pole. In the early 1900s the existence of ice at the North Pole was finally accepted. Before that there were several theories about a swirling warm ocean at the top of Earth and other interesting (but untrue) ideas. Explorers noted for their Arctic contributions are Nordenskjold (Sweden), Amundsen (Norway), Cook (USA), Peary (USA), Nansen (Norway), and Byrd (USA). 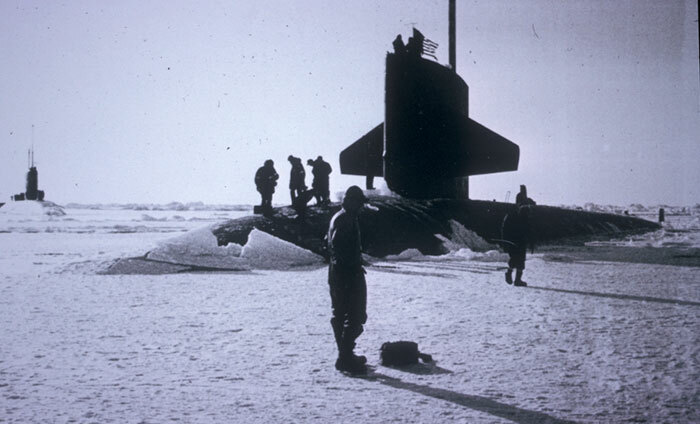 The submarine Nautilus (USA) traveled to the North Pole, under the ice, in 1958. This was the final proof that there was no land at the North Pole, just a frozen ocean. The trip was 1,830 miles from the Pacific Ocean, through the Bering Strait, past the North Pole, to the Atlantic Ocean off the east coast of Greenland, then past Iceland and down to Ireland. Thus, describing the Arctic as an "ocean of ice" is very appropriate. Polar sea ice is frozen sea water that forms during winter and melts back during summer. Every year about half of the Arctic sea ice melts each summer. It is rarely any thicker than six to twelve feet. As this ice forms (just below a minus two degrees Centigrade) ice crystals of frozen water develop. 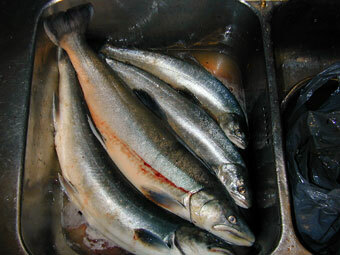 These are devoid of salt so the liquid water in between becomes saltier and saltier – forming a brine. 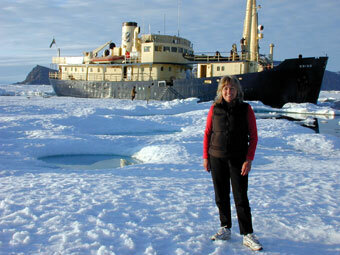 Solid sea ice is permeated with channels of salty brine as the ice crystals fuse together forming a larger and larger ice lattice in the form of ice rind (less than a centimeter thick and sometimes called grease ice), pancake ice (thicker pieces of ice that form circles bumping against each other up to a few meters across), and ice floes (solid ice). These are all the stages (crystals, rind, pancake, floe) of the freezing of sea water which cycles between freezing and thawing along the edge of the polar ice cap each year. 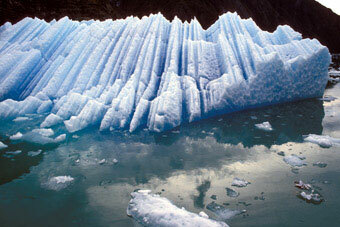 The edges of each piece of ice commonly have the holes and channels filled with salty brine produced by this process. 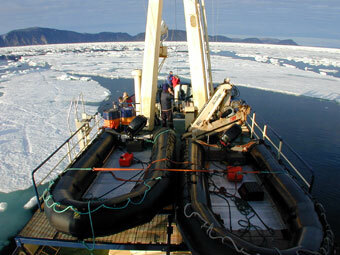 A sympagic (ice-associated) community lives associated with the sea ice and briny channels. This begins with diatoms (single-celled Protoctistan algae) and bacteria as the primary producers, zooplanktonic herbivores as the primary consumers and carnivores (zooplanktonic or larger animals) as the secondary (and tertiary) consumers. 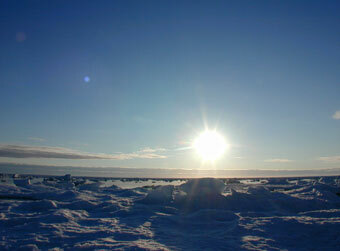 Most of the sympagic community is in the lower few centimeters of the sea ice. The diatoms (over 200 species in the Arctic) may attach directly to the ice on the outside of the floe or along the brine channels. The herbivores (mostly small crustaceans like copepods) crawl along the bottom of the ice and may duck in and out of the briny ice channels for safety. Some sympagic species are also planktonic. Many of the herbivores and carnivores (consumers) of the sympagic community may spend time just drifting in the ocean currents as plankton. These include a number of copepods that migrate daily from deeper water to feed on the lower surface of the ice. They also include larval forms of benthic animals that may be found over the shallow Arctic continental shelves. Larger planktonic carnivores may also come to feed on the sympagic community. 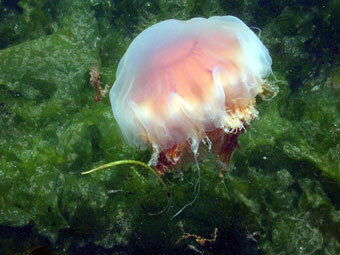 These include ‘jellies’ like ctenophores and jellyfish. The ctenophores are thought to consume up to nine percent of the copepods each day. 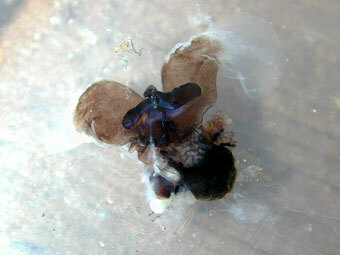 The Arctic also has large blooms of planktonic snails called pteropods which are food for many of the filter feeders. A rich bottom fauna exists in the Arctic. 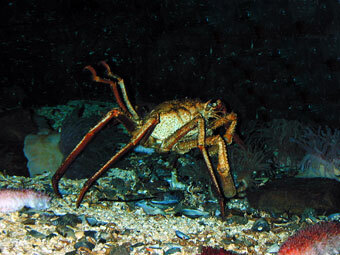 These species include numerous invertebrates such as anemones, worms, bivalves, crabs, sea stars, and sea cucumbers. 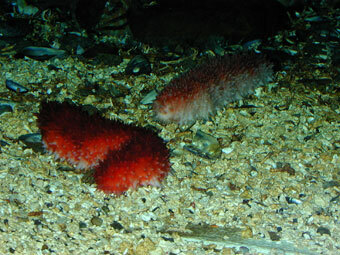 The Arctic benthic species exist in very cold water – close to freezing temperatures. Their adaptations for this cold temperature include enzymes that work well at near freezing temperatures and slower body processes (metabolism). Many of these Arctic species live ten times longer than their tropical counterparts because of this. The benthos depends on organics from the surface water. These organics are probably more abundant over the continental shelves but there have been few studies to prove this so far. Several studies are concentrating on benthic bacteria that can be found to the order of a billion or more per teaspoon of Arctic bottom sediment. A number of these may just be dormant, or they may actually be part of the food chain, as yet unknown. A typical Arctic food chain (simplified) showing trophic (feeding) levels and position of decomposers. Bacteria may recycle organic matter. Many bacteria function as decomposers, completing the trophic cycle in the ocean from diatom producers to the small planktonic primary consumers (copepods) and on up the food chain to the carnivores. Along the way dead organisms are consumed by scavengers or decomposed. Most decomposition is on the bottom in the ocean because dead organisms tend to sink. The decomposers release the nutrients (in the form of nitrogen, potassium, phosphorus, etc.) from the dead bodies back into the water and these nutrients are used as fertilizers by the producers. 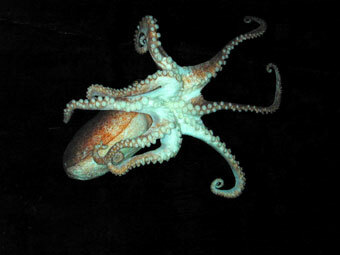 Top carnivores include the cephalopods (seven species of octopus and squid in the Arctic) and fish. There is also an interesting community on land that has some effect on the marine environment. Several major carnivores, feeding on marine organisms, may be considered here such as sea birds and mammals (including seals, walruses and polar bears).